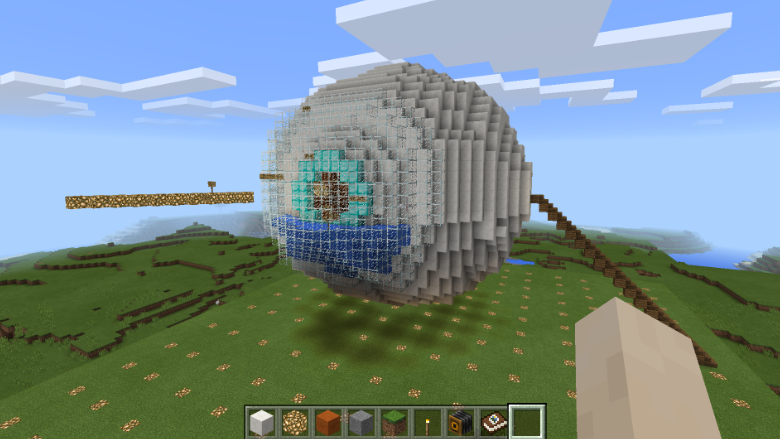 This is an exterior view of the human eye built in Minecraft. Microsoft has seen the potential of Minecraft as a learning tool. Now it's ready to use the video game as a way to expand its presence in schools. The company will launch a new version of Minecraft for schools this summer, and offer free trial versions. As part of its plans, Microsoft will also acquire an existing version of the software, MinecraftEdu, from an independent developer, Teacher Gaming. Minecraft is an insanely popular online video game that allows players to build their own virtual worlds using blocks. More than 22 million people own the game, and more than 7,000 classrooms in 40 countries already have MinecraftEdu. But because there isn't a central "point" to the game, players have to create their own story. "Teachers discovered that this allowed them to create lessons through Minecraft [modifications]," Vu Bui told CNNMoney in a recent interview. Bui is COO of Minecraft developer Mojang, which Microsoft bought in 2014 for $2.5 billion. Instructors use Minecraft to teach everything from coding and math, to history, geography and civil engineering. Students can work on assignments inside and outside of the classroom. The game is one example of how schools are testing more "personalized" forms of teaching through tech. "It's not that it helps kids learn different," Rafranz Davis said in a video statement. "[It's that] it helps us see the way that they learn different, and I think that is the biggest game changer." She's a teacher and technology planning administrator in Texas. While some may fear that the game will decrease the amount of time kids spend socializing, Davis has found the opposite to be true. "The first time, there is that fear," she told CNNMoney. But it's great for group projects, she added, and students end up training teachers sometimes. The new Minecraft: Education Edition will have better maps with coordinates that teachers and students can use to navigate virtual worlds. The multi-player mode will also be built to accommodate up to 40 students. And like many new platforms, Minecraft: Education Edition will have a social media component. But kids are fickle, and what's cool today may be lame tomorrow. So is Microsoft (MSFT) risking the Minecraft brand by associating it with school and homework? "Minecraft isn't cool because of the game," he told CNNMoney. "It's cool because of the people who create stuff within it." In addition to Minecraft, Microsoft also has educational versions of its other popular software products, including Office 365, Windows 10, and Skype. Microsoft also announced the beta launch of some new OneNote features that helps people with reading disabilities improve comprehension.